CSD Dance Recital 2018 - Show #2 - Shine Bright! 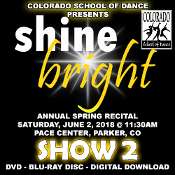 Our Products >> CSD Recital 2018 - Show #2 - Shine Bright! CSD Recital 2018 - Show #2 - Shine Bright! Veria Video In Association With The Colorado School of Dance in Parker, CO presents Shine Bright! on DVD & Blu-ray Disc as performed on Saturday, June 2, 2018 at 11:30 a.m. Estimated time of completion / delivery is 6 - 8 weeks after filming of event. Digital Copy HD downloads will also be made available for an additional $5!